Halloween is one of my favorite holidays. I absolutely hate being scared and I can’t stand blood, gore, or spiders, but there’s something about getting to be anything you want for a day – and being able to eat as much candy as you want. Last year, we created a manicure that emphasized the scary side of Halloween, with drops of “blood” and spider webs. This year, we’re embracing the side of Halloween that’s a bit more fun. After prepping my nails, I applied two coats of Nailtini’s Mai Tai, which is a vibrant coral-y orange, the perfect shade of orange for people who don’t actually like orange (aka, me). I got this color in my Ipsy bag and I’m absolutely in love with it. I created the black cat nail art entirely with a black Sharpie marker, so you’ll want to make sure the polish is totally dry before beginning the design. Once your nails are dry, you can begin the design by drawing a black circle in the middle of your nail – this will be the cat’s head. Continue by adding on two pointy ears. Next, draw a line straight down from the center of the circle to the tip of your nail – this is the front of the cat. Draw a curved line from the cat’s head, down and out, to create the back of the cat. Finish the cat by adding a cute, curly tail! Let your nail art dry for a minute or two before sealing it in with your favorite topcoat. My topcoat of the moment is Essie’s Good To Go. 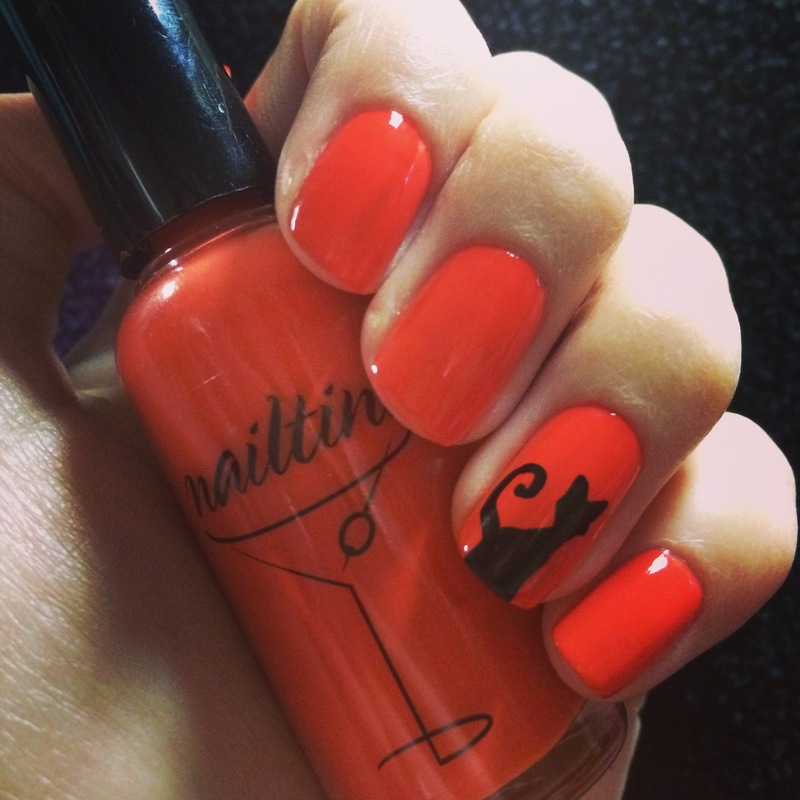 What spooky nail art are you sporting for Halloween? Share it with us on Facebook! Kathleen: These are the perfect nails for Halloween; what a great idea.